Necrotic tissue, due to Tomato ringspot virus, at the exposed graft line between a 'Golden Delicious' scion and a 'M1-106' rootstock. Cause Many apple trees in the Pacific Northwest are carrying one or more latent viruses. Most infections by the "latent viruses" do not cause disease symptoms or reduce tree growth or yield on commercial cultivars. Several nematode-transmitted viruses have been associated with virus-induced incompatibility. Strains of Tomato ringspot virus (TmRSV) have been isolated from declining apple trees in states along the East Coast and in Michigan and Oregon. Similar symptoms also have been observed in trees where TmRSV has not been isolated. Other virus or virus-like abnormalities observed in the Pacific Northwest include star crack on 'Gravenstein' and flat apple on several cultivars. Apple hammerhead viroid (AHVd) is known to produce trunk swelling and splitting in Gala apple. Both Citrus concave gum-associated virus (CCGaV) and AHVd were found associated with a rapid decline and dieback of Honeycrisp apples which also had several latent viruses. Symptoms Symptom expression varies considerably among cultivars and among strains of the same virus. Thus the scion may be symptomless and the rootstock very sensitive. 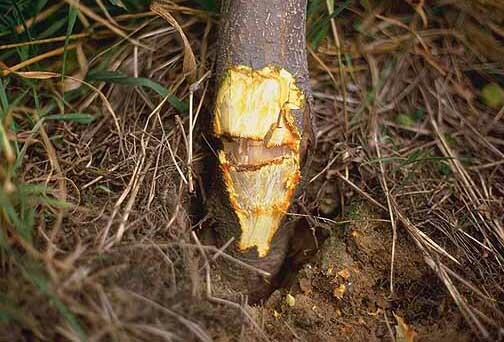 All other combinations also have been reported such as rootstock symptomless and scion very susceptible, both scion and rootstock susceptible, and both symptomless. When a virus enters the symptomless portion of the tree, reaction may be severe when the virus reaches the sensitive portion. This may cause cell death at the graft union and result in virus-induced incompatibility. The resulting symptoms are those of decline, collapse, or tree breakage. Fruits on the flat-apple-affected trees are smaller, flatter, and show a tendency for the calyx end to be open. Latent viruses in apples are very harmful to many crabapples. Symptoms in crabapples include stem pitting, foliage spotting, misshapen fruit, and tree decline or collapse. Considerable russet ring symptoms have been observed in the Hood River, Oregon area. These superficial rings occur on the fruit and can be as large as a half-dollar. Cultivars affected were Golden Delicious and Newtown. If replanting in virus-infected areas of the orchard, use both rootstocks and scions that are tolerant of the virus. The practice of top-working apple trees to 'Hyslop', 'Columbia', 'Virginia Crab', or other crab seedlings is strongly discouraged.